Fantastic sounding pressing. I have the original Creation LP from 1993 and this one is far superior. How does this compare sound wise to the 2011 repress? Probably goes without say, but f**k this album is amazing and never gets old! If for some reason you've been living under a rock for the last 25 years, get your head in the game and listen to this masterpiece! So damn good! Thank you Adam and Co. for this gem! Creation released many great albums around the period of the late 80's and the early '90's and this Swervy album 'Mezcal Head' sits among them at the top of the list. In fact it's one of the best albums of the 1990's full stop. It's a damn near perfect record and is truly deserving of it's (cult) classic status. 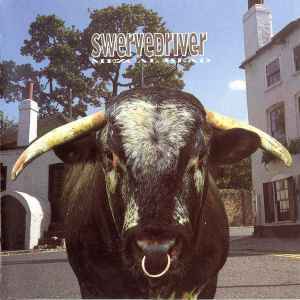 It seems that many groups struggle to top their debut albums but not in Swervedriver's case...they got even better on their follow up. It's everything that is great about Swerevdriver on one album. It's inspired and down right addictive - full of energy and a vibrancy in their playing. The band just stepped everything up from 'Raise' by a good few notches and literally raised the bar here. It's the melodies that come through much more strongly. Mezcal Head is a blissful noise right from the get-go and barely lets up; crescendos of bright shimmering guitar lines driven by tight powerful drumming throughout but cutting through all of this are mesmeric melodies like beams of bright sunlight that just grab hold of you and don't let you go. There are songs on here that you don't want to end....it's noisy, it's hypnotic, it's dreamy and the superb front cover reflects the spirit which emerges from out the grooves: hot & hazey. It's Swervedriver at their best. Different track listings than the original 1993 vinyl which has "Mickey" as track A4 but this has "MM Abduction", and '93s track B1 is "Dragging It Under" versus 2011 has "Harry & Maggie". Same songs but different titles. Does Side 2 track B1 really say "Dragging It Under" versus the more limited edition/colored version which has "Harry & Maggie"? Same song but different titles. This is different from the original '93 vinyl release which has A4 "Mickey" and B1 "Dragging It Under". FYI: I received a copy without the insert, all I did was send them an email asking if I could get one and they did! I found this pressing to be very good. I can only compare to the original cd release and the remastered cd release, but the sound is detailed, well balanced and full. While MOV has a spotty reputation (I've only heard two of their pressings, one was excellent and the other was disappointing) I think they've done a fine job with this pressing. Swervedriver fans, purchase with confidence.